This chi charm is from my personal collection, and those who know me well know my passion for pink. 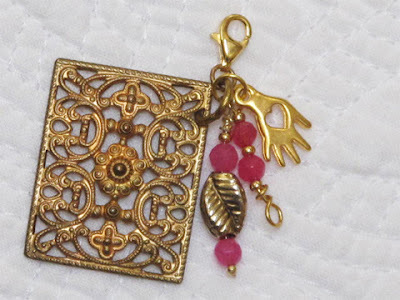 Not that I have to be all matchy matchy, but pink jewelry is hard to find, so I took the situation into my own hands and made some earrings and charms to go with summer outfits. The hamsa, or hand charm symbolizes the creator's hand, and while it offers protection, it is also thought to draw positive energy and abundance to the wearer. Wishing you a day and week of good chi!